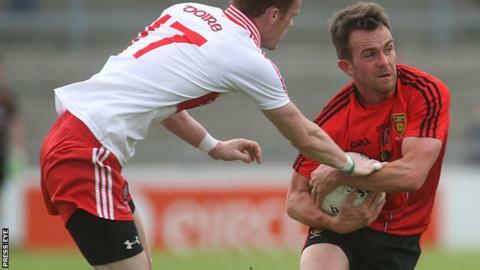 Down have made four changes to the side which lost the Division Two league final for their Ulster senior football championship match against Derry. Ryan Boyle and Damian Turley earn a recall in defence for Sunday's first round tie with Peter Fitzpatrick replacing Peter Turley in midfield. Mark Poland, injured in the league final warm-up against Roscommon in Croke Park, returns to the forwards. Brendan Rogers will make his inter-county debut for Derry in Celtic Park. Rogers, 21, has never played senior county football but was called into the squad after helping Slaughtneil's run to the All-Ireland club final in March. He is named at full-back with clubmate Chrissy McKaigue at centre half-back. Veteran midfielder Fergal Doherty has been passed fit to start while, in attack, Eoin Bradley makes his first championship appearance since 2013. Doherty has been paired in midfield with Niall Holly, who makes his first championship start in Celtic Park after several seasons in the squad. Down playmaker Mark Poland will pull the strings for the Mourne county after recovering from an eye injury, sustained when he was hit in the face with a ball during the warm-up before the league final defeat by Roscommon. Darragh O'Hanlon drops out of the attack to accommodate his return, with Gerard Collins and Aidan Carr losing out in the backs. Down manager Jim McCorry has named Paul Devlin in midfield. However it is anticipated either Kevin McKernan or championship debutant Caolan Mooney, who are both named in the half-forward line, will drop into midfield to partner Peter Fitzpatrick. Derry: T Mallon; O Duffy, B Rogers, D McBride; K Johnston, C McKaigue, C McFaul; N Holly, F Doherty; SL McGoldrick, M Lynch, E Lynn; B Heron, E Bradley, D Heavron.